When I heard what Life Coaching was about I wanted to help in any way I could. I knew I could help Karen have an online presence and platform to help others on a larger scale. Karen Leafe Coaching needed to be inviting and soft to encourage people to browse the site and feel at ease and comfortable with their surroundings. The website also needed to be responsive, allowing people to access this information on their mobile phone or tablet device. It also provides a quick and easy way to get in touch, even when you’re on the move so needed to be easy to navigate. I’m really pleased with the solution to this website. I chose soft pastel tones to create a tranquil and inviting experience. I wanted the users of the website to know exactly what they were doing from the get go. The navigation is clear and concise and easy to access with well structured titles making it even easier for people to find specific information on life coaching and its more in depth areas. I designed this website from scratch starting with an initial concept and wireframe and moving onto the final designed website. 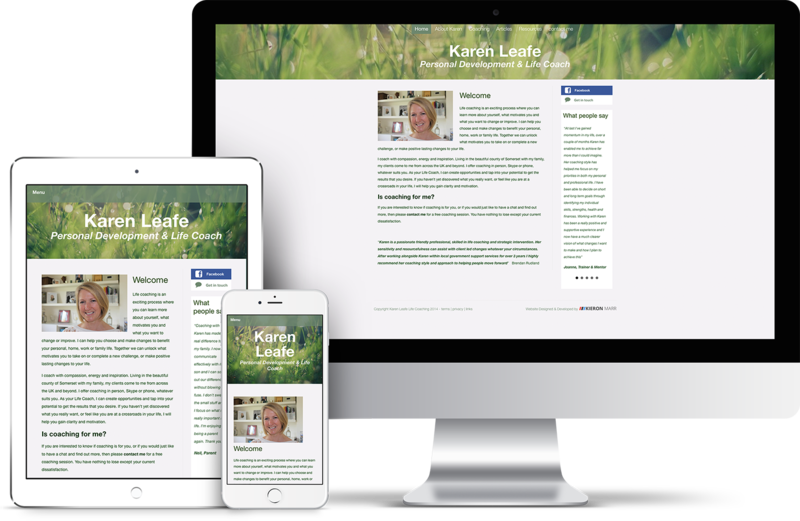 Karen Leafe Coaching has a neutral tone throughout to create an inviting website. I used WordPress for this project as the basic CMS and built upon it to get the functionality the website required. This isn’t a complex website, taking advantage of the basic WordPress functionality and adding some additional functionality including the ability to add contact forms, track site traffic and optimise the website for search engines.